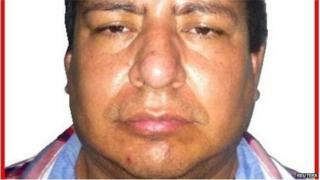 Mexican authorities say they have jailed the head of a major criminal gang in the southern state of Guerrero. The alleged boss of the Los Rojos – the Reds – cartel, Leonor Nava Romero, was arrested on Friday. He is alleged to be a close partner of one of Mexico's most wanted crime barons, Hector Beltran Leyva, and accused of murders and kidnappings. In February, the authorities arrested the boss of the Sinaloa Cartel, Joaquin Guzman, known as El Chapo or Shorty. Last year, Miguel Angel Trevino, the leader of another major cartel, the Zetas, was jailed. Federal police say Leonor Nava Romero, also known as The Claw or The Tiger, was carrying an assault rifle and ammunition. Investigators say Mr Nava Romero is linked to operations arms smuggling operations of the Beltran Leyva cartel into the US. "He is also suspected of the murder of eight officers of the National Defence Secretary in 2008," National Security Commissioner Monte Alejandro Rubido told reporters. Since taking office in 2012, President Enrique Pena Nieto has defended a different approach to the "war on drugs" policy of his predecessor, Felipe Calderon, which critics say led to a rise in violence throughout Mexico. Besides Joaquin Guzman, several other suspected criminals have been arrested or killed by Mexican security forces since Mr Pena Nieto came to power. In some of Mexican remote regions, the violent cartel's actions led to farmers taking up arms as vigilante groups against the criminals – which Mr Pena Nieto's government recently incorporated as Rural Police officers. Will arrest of 'El Chapo' Guzman curb Chicago drugs?